SEOUL, Jun. 7, 2011 – LG Electronics (LG) will be showcasing its latest solar energy solutions at Intersolar 2011, the world’s largest solar exhibition, in Munich, Germany from June 8 - 10. Visitors to LG’s booth in Hall A2 (Stand 360) will be able to see the company’s advanced Mono XTM and Multi XTM solar modules, which are 8.3 percent and 4.3 percent more efficient, respectively, than conventional models. The Mono X boasts the highest energy efficiency among all LG modules in its class. While conventional mono module units operate at 240W, Mono X runs at a more efficient 260W and is designed to be easier and less expensive to install. The Multi X, LG’s powerful new photovoltaic module, boasts 240W of power with the same levels of energy efficiency as conventional mono module units. And because LG’s advanced surface treatment technology absorbs more sunlight, energy output is much greater than conventional multi-crystalline solar cells. What’s more, the night blue cell color and piano black frame adds a stylish finish to the Multi X’s clean design. 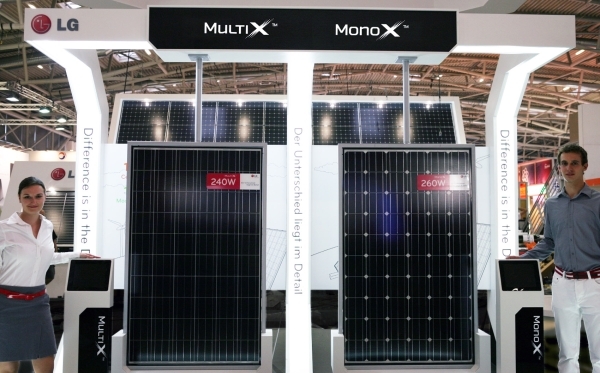 With an industry leading 25-year guarantee and LG’s commitment to providing comprehensive customer service, the Mono X and Multi X were developed at LG’s solar module test lab, which is certified by both TÜV and UL, an industry first. The test lab enabled the company to utilize its own proprietary processes to ensure high product quality and durability. The new solar modules are rated to withstand frontal and rear pressure of 5400Pa, as well as the harshest climate conditions. Visitors to LG’s booth at Intersolar will be able to view a 3D film demonstrating LG solar modules undergoing testing in extreme conditions. LG’s solar cell products can be fitted to a wide range of different-sized solar modules. Available in sizes 4X9, 6X8, 6X9, 6X12 and 6X10, LG’s solar products have been specifically designed to meet the needs of almost every customer.